Who is Devi Durga and why do we call her Her Mother? I write this post as a tribute to Maa Durga. The feminine cosmic energy that pervades the universe. She is the mother of creation. Thus, she is our mother. Her leela with her consort Shiva manifests this universe out of unmanifested nothingness. She is the “yin” in Chinese philosophy of yin-yang, the two primordial energy forms. She is called as Durga, Kali, Lakshmi and other names in Hinduism. She is the force. Every energy that creates any movement in this universe is attributed to her. She is the Adishakti. The most ancient Energy. Our body, just like everything else in the universe is a product of leela between the Male and Female energy. This is the process of creation between male and female at the most basic level. 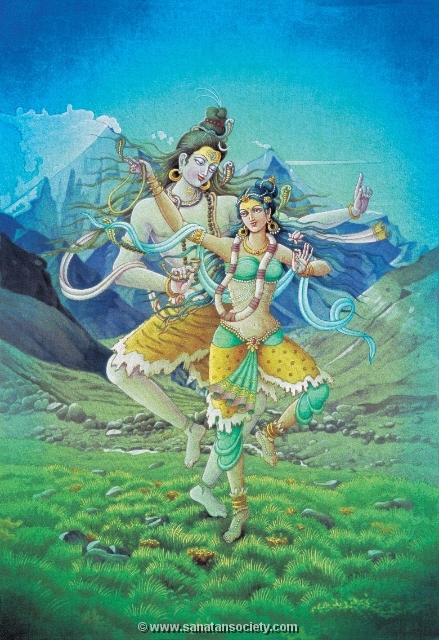 These two forms of energies are called Shiva and Shakti, or Purusha and Prakriti in Hinduism. This philosophy travelled across the world and formed the origin of a story which is found in major religions today. Story of the universe being born out of one man and one woman. Adam and eve in Christianity, Adam and Habba in Islam. Now this story is proven wrong by science as it’s practically not possible for two people to create a whole race. This theory gives science the firepower to ridicule religion. The story was absorbed but the inherent message that it was not two people but two cosmic energies playing the divine game, got lost over time. When Purans were written in India, the rishis tried to save Vedic knowledge in the form of stories. They did an excellent job as the stories were able to preserve the message till today but a lot of essence of these stories have been forgotten. Thus, Idols in Hinduism are just personification of different energy forms which is the essence of all. As explained in Upanishads. any golden ornament be it an ear ring, or a bracelet etc. are all essentially gold, similarly we may look different in from but are essentially just one, one all-pervasive energy. This personification proves extremely useful in remembering this energy. The name Water, For example is not the material water in itself. The word water won’t quench your thirst. The name is different from water. But the word water instantly reminds us of the element water. This is how idols work, as tools for remembrance. Personification agrees with the Vedic view that God can be both Nirguna or Saguna, formless or with form. While other religion worship through prayers, Hindu way of worship is meditation. And, meditation is nothing but an unbroken stream of remembrance. And Idols become easy tools for remembrance. When we see the Durga Idol, we are instantly reminded of the mother energy. A mother is fierce in protecting her child, and Maa Durga’s one hand denotes the gesture of blessing and other of protection. Forgive me, oh Lord, for three mistake: I know and feel that You are all pervading and omnipresent and yet I walked all the way here to worship You within the confines of this temple. I know that there is only one non-dual truth and thus there is no difference between You and me. Yet I worship You as though You are different from me and outside of me. Finally, I know that ‘mistake’ is simply a self-created concept and yet I’m asking You to forgive me. Excerpt from my upcoming book: Children of Immortal Bliss. Why Modi deserves as much praise as the Indian Army?